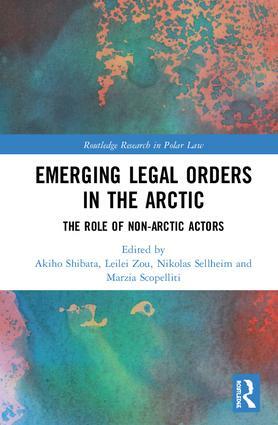 At the 12th Polar Law Symposium in Hobart, Tasmania (1-4 December 2019), PCRC will establish a special session comprising of two panels: “International law for the Arctic: The future agenda for post-ArCS legal and policy research 2020-25” and “The resilience of the Antarctic Treaty System to the current and future challenges”. The travel funding will be available for successful presenters. The deadline of submissions is now Tuesday, 30 April 2019. Please apply! For details, see the symposium website. Dr. Christoph Humrich, Assistant Professor for International Relations and Security Studies, and Associated Researcher at the Arctic Centre, University of Groningen, The Netherlands will assume as a visiting associate professor of GSICS and PCRC fellow from April 15 - July 5, 2019. Please see “Who Runs the Centre?” for further profiles. On February 5, 2019 PCRC convened the 11th and 12th international law seminar. In this seminar, Mr. Romain F.R. Chuffart, LL.D. 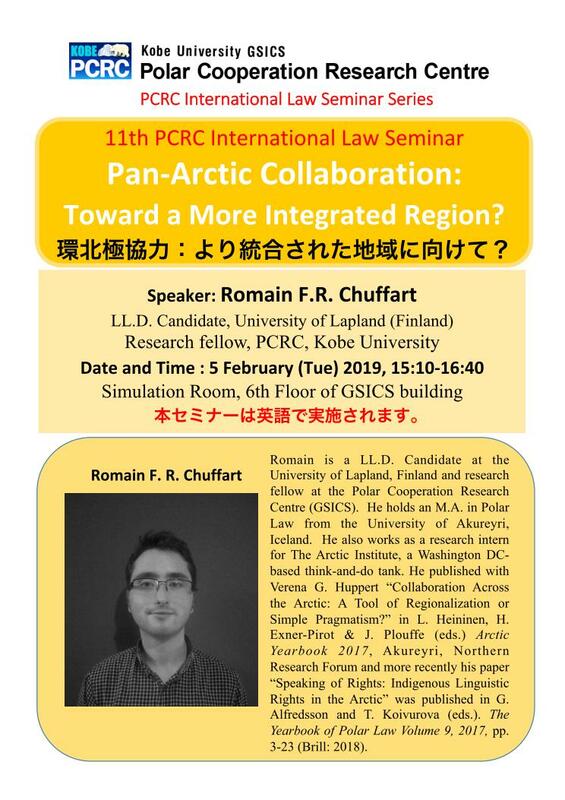 Candidate, University of Lapland (Finland) and Research fellow at PCRC, gave a presentation on "Pan-Arctic Collaboration: Toward a More Integrated Region? ", and Mr. Tony Cabus, LL.D. 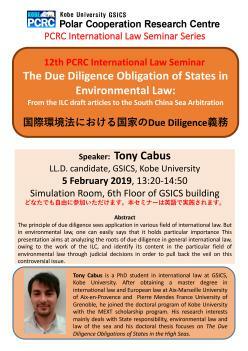 candidate, GSICS, Kobe University, gave a presentation on "The Due Diligence Obligation of States in Environmental Law". For details, please see the seminar flyers: 11th seminar, 12th seminar. 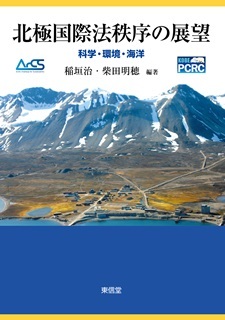 The Arctic Circle China Forum "China and the Arctic" will be held in Shanghai, China, May 10-11. The details of the programe is available from here. Currently Finland holds the Chairmanship of the Arctic Council in 2017–2019. The Ministerial Meeting in Rovaniemi on 7 May 2019 will mark the end of Finland's Arctic Council Chairmanship. Next Chairmanship goes to Iceland. The International Arctic Forum is a key platform for discussing current issues relating to the socioeconomic development of Arctic regions. At the 5th forum, more than 3,600 participants, including representatives of Russian and international political, scientific and business circles, the mass media were attended.